Product Description : You’ll sea: Our citrus bar is as smooth as the Mediterranean. 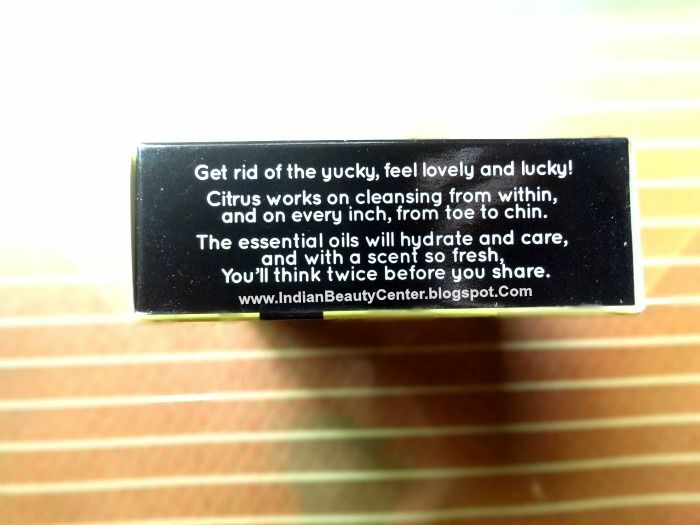 Get rid of the yucky, feel lovely and lucky! Citrus works on cleansing from within, and on every inch, from toe to chin. The essential oils will hydrate and care, and with a scent so fresh, you'll think twice before you share. 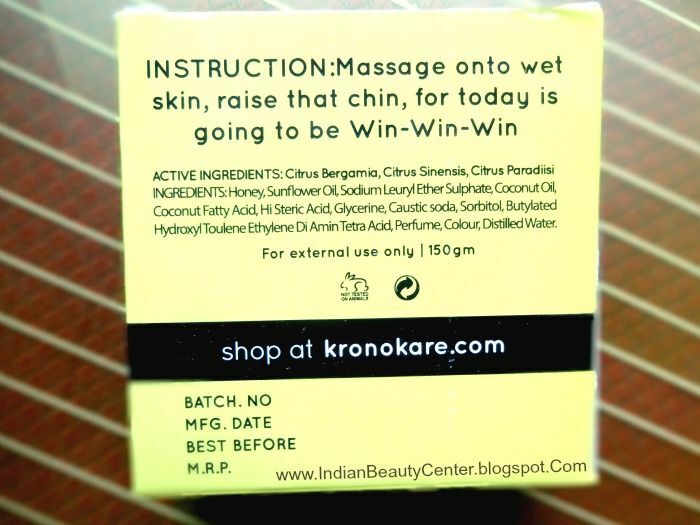 Directions for Use : Massage onto wet skin, raise that chin, for today is going to be Win-Win-Win. 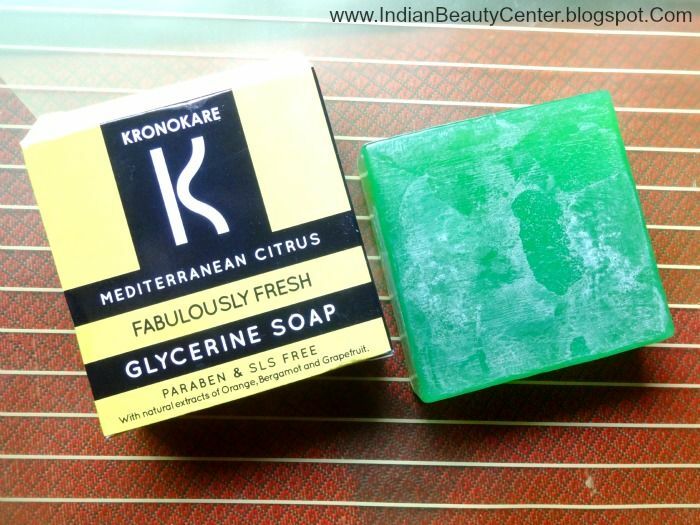 It's the Kronokare glycerin soap that comes in a lime green colored outer box, which mentions everything you need to know about the body soap. It contains SLES, which is less harmful and less comedogenic than SLS as a lathering agent. The soap is wrapped in an outer plastic wrap to protect it from sticking to the insides of the cardboard box. I am a lot into soaps these days and I love trying different kinds of soaps, with different fragrances. It has a citrus fragrance, which is a bit soapy. I like the fragrance as it is not overpowering and it is mild enough for sensitive noses. 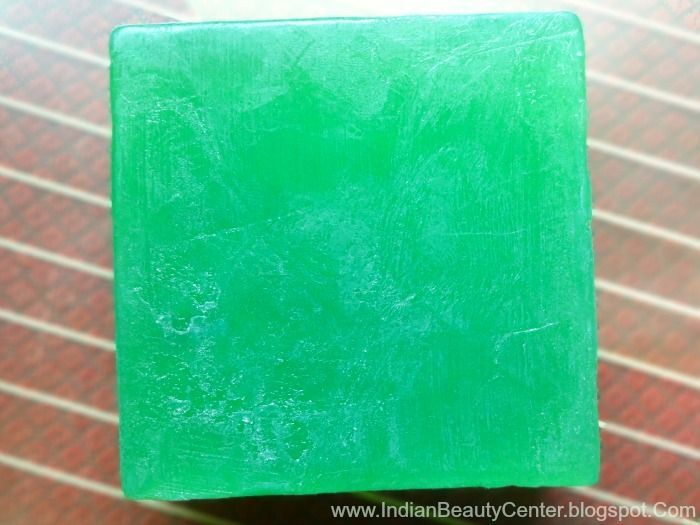 The soap is translucent and it's a see-through glycerine soap. It lathers really well and I only need to swipe it a couple of times on my skin for that perfect lather. You can even rub some of the soap onto a loofah for even more lather and mild scrubbing effect. It lathers well and cleanses the skin perfectly, removes all dirt, grime and odour from the skin. 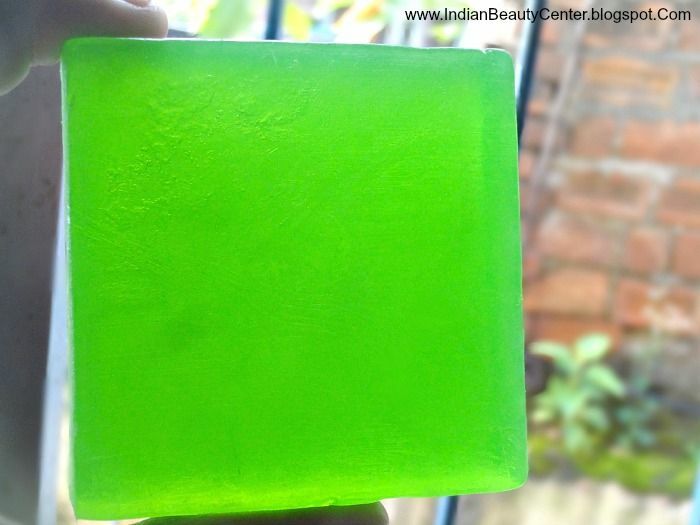 However, the fragrance does not linger onto the skin at all, which I think is a minus point about this beautiful lime green soap. It does not over dry the skin, which is a good thing. But, don't think that you can skip your moisturizer after using this. You definitely need to moisturize your body using a good body moisturiser. It melts faster than normal soaps, as it is contains honey and glycerine as the primary ingredients. Also, towards the end, it breaks away into small pieces, which I do not like, but can deal with it. My skin feels fresh and squeaky clean after using this soap on my body and definitely it is a good soap. It's not that expensive as you really get a huge bar of soap that would last you a long time. I like this soap and if you want to try a good soap, then this won't disappoint you. I just wish the fragrance lasted a bit longer on my skin. 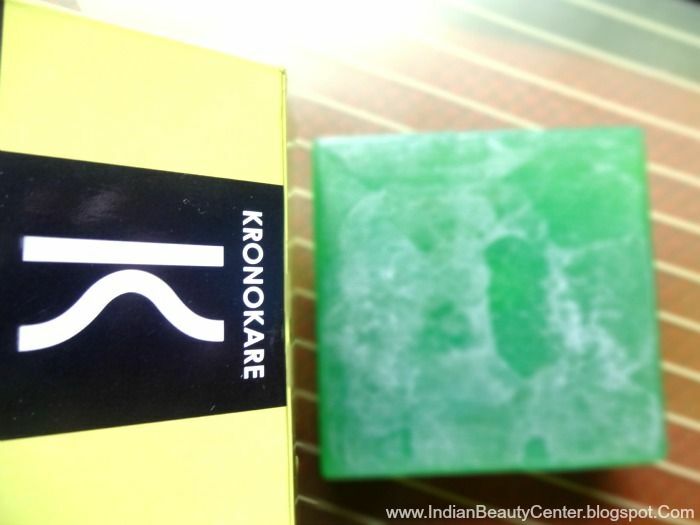 Final Verdict : If you want to try out a good soap from a new brand, then Kronokare would definitely be a nice choice. They have many soaps in their collection and you can choose one for yourself without regretting. The soaps are really big and you can cut them and store them as well. 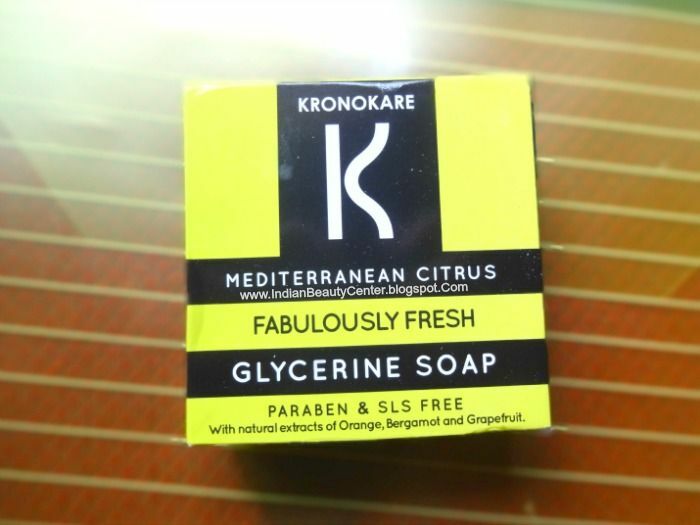 I liked this fabulously fresh soap from Kronokare and would love to try the other varieties as well. At least they are paraben and SLS free, so good for the skin! Plus, it contains honey, glycerine and coconut oil to make us happy!